As part of our commitment to remain on the competing edge of industry technology, we are pleased to announce that we are upgrading Armada Connect™. Connecting with our customers has always been our number one priority. Our newly designed application will help us continue to provide the extraordinary customer service you have come to expect. New features make account management simple and easy! Mobile friendly design. Access Armada Connect™ from anywhere! Meet your new dashboard. All the information you need, with fewer clicks! Downloadable PDFs right from your phone. Secure and ease of access. Login and manage your account using your email address. Resetting passwords made easy. Market news. Stay up-to-date on market news and leverage the same information we do. Alerts and new programs will be posted to keep you up to date on BP changes as well as changes at Armada Oil & Gas Company. Quick and easy reports! 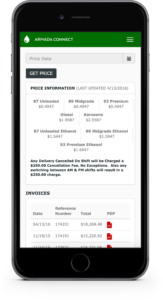 View monthly totals of your credit card fees, BP loyalties and gallons purchased. BP Helios Reports. The BP brand represents both what we do and what we aspire to do as an organization. Simple and easy access to your BP Helios scoreboard helps ensure that your branding is always up to date. ARMADA provides opportunities for its team members. Our core values inspire growth and development. We are an entrepreneur business and all team members are given the opportunity to learn and grow.